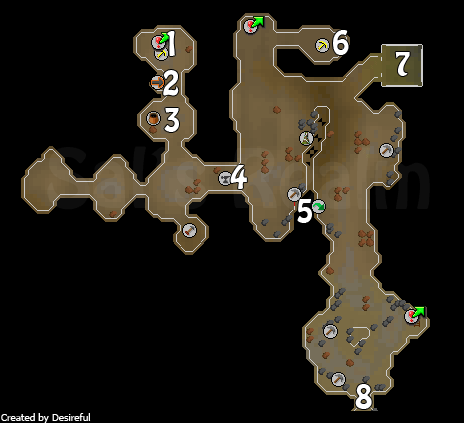 The Dwarven Mines are, of course, located underground, below the Falador area. The mines have quite a bit to offer, from several shops offering various pickaxes and ores, and lots of rocks with ores ranging from Tin to Adamantite. 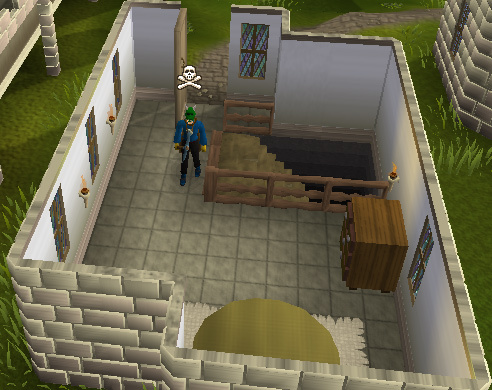 There are two entrances to the Dwarven Mines (plus the ladders to get into the Mining Guild, check out that guide for more info). 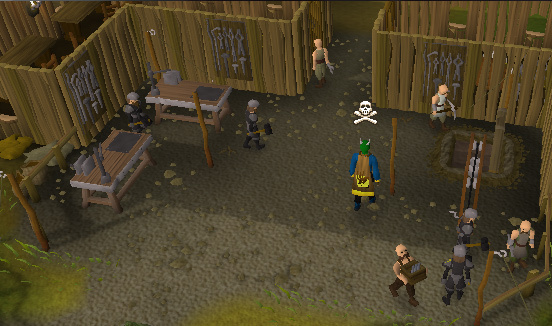 Nurmof's Pickaxe Shop is the place where you will get your pickaxes repaired, and you can buy new ones. Other then that there isn't anything to do in his shop. Its a rather dull place. There are some cave rocks and a counter (that has no use). Here is a cart that will bring you to Keldagrim. 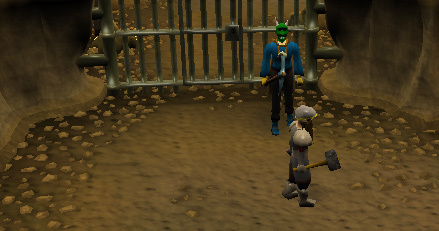 This costs 150gp. 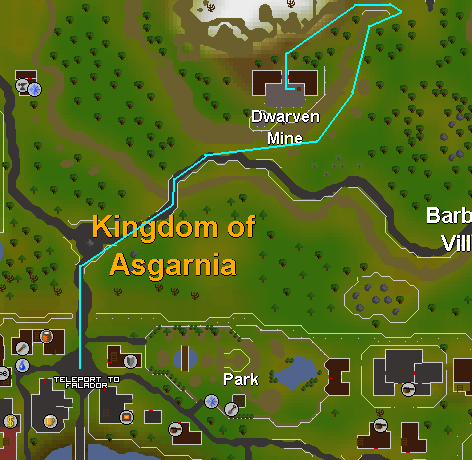 You will be put on a cart and be brought to the southwestern part of the eastern half of Keldagrim. Talk to the Cart Conductor to buy a ticket. The Dwarven Shopping store is just a general store. There are 3 boxes in the room, none of which have anything in them. Trade the Dwarf to view the wares. 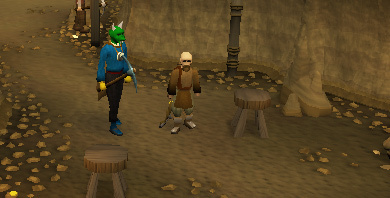 Just two anvils, used in smithing. South of the Anvils is a small room where you can find Hura the Crossbow Salesman. He sells crossbows and crossbow accessories, including crossbow stocks and limbs (used in making your own crossbows). 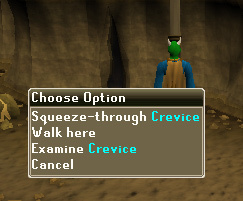 Just a crack in the wall, requires 42 agility to get through. Another shop.. This one buys your ore, and sells it out to other people. This shop does not restock on its own, so the prices I gave aren't what it will definitely be. Drogo resells what he is sold, and nothing else. One of the map pieces for the Dragon Slayer Quest is in here. 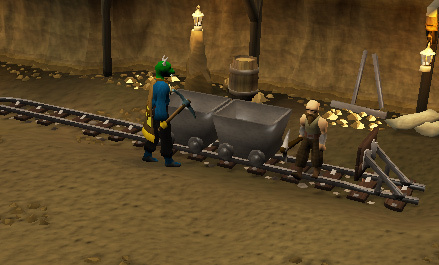 Here is the entrance to the Mining Guild.